Johane Masowe Echishanu’s big five have spoken out about the ongoing tiff between prophets within the church. 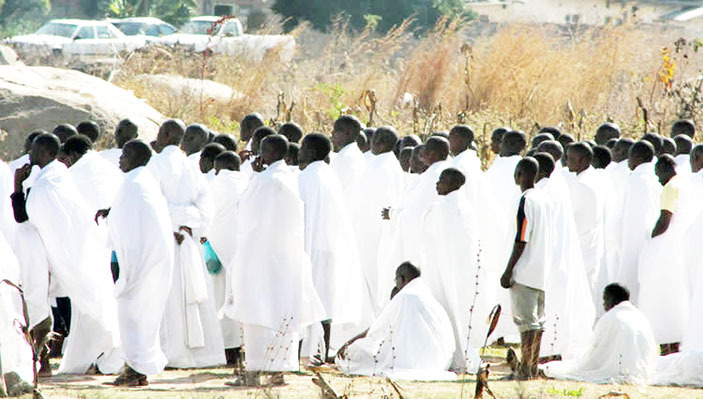 Senior member Madzibaba Israel, who operates at his Coca Cola shrine, has warned elements who seem to be diverting from the pattern of the church. The response came amid the claims made by another Bulawayo prophet, Madzibaba Emmanuel Mutuma who labelled all Harare based Johane Masowe prophets fake. Madzibaba Manu alleged that the prophets are stage-managing miracles using self-confessed hookers called mabhidhiri whom they pay perform stunts. He gave the stunning revelation over the prophets after he was criticised for flashing cash with his videos and images circulating on social media, WhatsApp. However, the friction between the members has prompted Madzibaba Israel to issue a stern warning that use of videos and images is against the church’s principles. He warned members to follow the protocol of the church. “We don’t allow the use of videos in church neither taking pictures or circulate them on social media. “Madzibaba Manu is going out of hand, isu hatidaro. “We are well-known for being humble and we remain God fearing. “Boasting of having money is not even Godly and we don’t want to see this in church. “Our services are for free and we are not supposed to make people pay,” he said. “When we hold annual conferences he does not even show up. Mdzibaba Israel who is a senior member in the ministry since 1979 also warned the prophets not to be competitive. “I think this is now going out of hand where members are fighting against each other. “We don’t compete in this church but members should just do zvinhu zvakanaka, zvisingasvibise church,” he said. The tiff seems far from being over as Madzibaba Manu is threatening to unearth more damning details against fellow members. He even threatened to leave the church.